4.5 Star accommodation - an oasis of luxury and tranquility! Positioned on the absolute ocean front and just a short stroll via seaside boardwalk to the enchanting Airlie Beach resort village; with its relaxed atmosphere and collection of eclectic shops and cafes; lies the Coral Sea Resort, your Airlie Beach Accommodation. 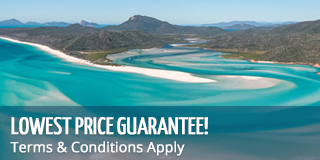 A stroll in the opposite direction crossing a separate boardwalk with the sea below is Abel Point Marina, your direct access to the Whitsunday Islands and the Great Barrier Reef. Coral Sea Resort features a variety of hotel rooms including deluxe suites and one, two and three bedroom apartments, penthouses and beach houses. Coral Sea Resort, located within the exclusive sea-side enclave of Airlie Beach, positioned on paradise point, is an oasis of luxury and tranquility just moments via seaside boardwalk to the enchanting Airlie Beach resort village that abounds with shops, attractions, restaurants and entertainment venues, offering the very best in Airlie Beach holiday accommodation. The resort has an extensive array of conference, meeting and wedding facilities that feature picturesque ocean views for up to 300 guests. 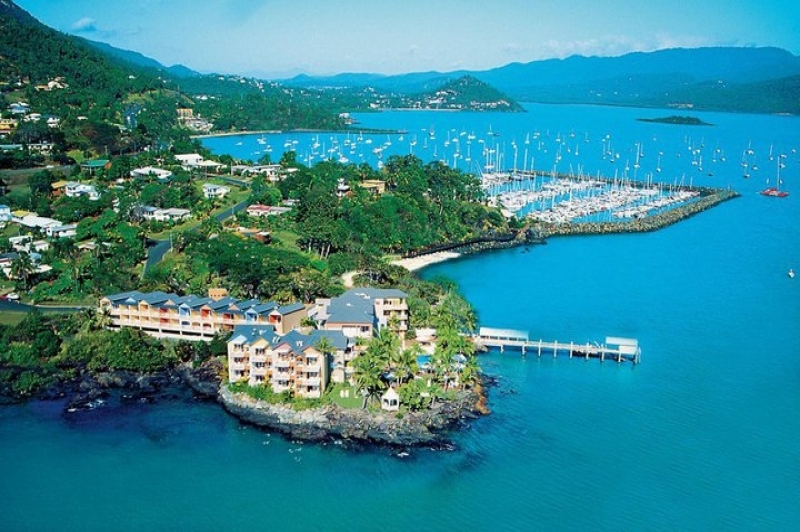 If you are searching for the most centrally-located and convenient family accommodation Airlie Beach has on offer, with a wide range of family-friendly facilities, Coral Sea Resort is the ultimate, unsurpassed destination. There is a uniquely nautical feeling in each of the spacious suites and penthouses, which reflect on the wonderful yachting heritage of the Whitsundays. Soft nautical colours, historic boating prints, polished timber and yachting memorabilia adorn many of the Resorts rooms and dining areas complete our superior Whitsundays accommodation. The adjoining marina, linked by a boardwalk to the Resort, offers those with salt in their veins a chance to wander through the amazing array of charter yachts and luxury vessels to work off breakfast, lunch or dinner, indulged in at our award-winning restaurant. The Garden View Rooms have a queen size bed, some rooms with an additional queen bed and garden views. Twin bedding is on request only (2 Queen Beds). Prices are based on two people sharing. Please ask about additional pricing for 3 and 4 person occupancy. There is a maximum of four guests, with 'Stay and Save' and 'Stay Longer' pricing available. The Ocean View Rooms have a queen size bed; some rooms with an additional queen bed and feature a private balcony with beautiful sea views. Twin bedding is on request only (2 Queen Beds). Prices are based on two people sharing. Please ask about additional pricing for 3 and 4 person occupancy. There is a maximum of four guests, with 'Stay and Save' and 'Stay Longer' pricing available. The Bay View Spa Suites are located on the oceanfront. They feature a large private balcony, a queen size bed and an internal spa bath with timber louvers opening into the room. Suite will consist of one queen size bed only, with the option of a rollaway bed. Twin bedding is one Queen Bed+ a rollaway bed only. Includes breakfast. Prices are based on two people sharing. Please ask about pricing for 3 person occupancy. This room allows a maximum of 4 guests, with 'Stay and Save' and 'Stay Longer' pricing available. The Coral Sea Spa Suites are built on the high watermark on the absolute oceanfront. They feature a king size bed, and a luxurious outdoor balcony spa and double hammock all overlooking magnificent sea views. Suite will consist of one King bed only, with an option for a rollaway bed. This room includes breakfast, with a maximum of 3 guests (either 2 adults, or 2 adults & 1 child). Please ask about pricing for 3 person occupancy. 'Stay and Save' and 'Stay Longer' pricing available. There are 1,2, and 3 bedroom apartments, each with a kitchen, dining space, internet and balcony. The 1 bedroom apartment pricing is based on 2 people sharing with option to add third person at an additional cost. The 2 bedroom apartment has a maximum occupancy of 5 guests and the 3 bedroom has a maximum of 7 guests. 'Stay and Save' and 'Stay Longer' pricing available for all apartments. The romantic Penthouse accommodation is located on the top floor. There are 1, 2, and 3 bedroom options available. Base pricing is based on 2 people sharing. 1 bedroom penthouse has a maximum of 3 people occupancy, with an additional cost for 3rd person. The 2 bedroom penthouse allows a maximum of 5 guests and the 3 bedroom penthouse allows a maximum of 7 guests. 'Stay and Save' and 'Stay Longer' pricing available for all room types. Ask us about 'Stay and Save' rates or 'Stay Longer' options for stays longer than 3 consecutive nights. Tropical breakfast included with rooms and suites (not with the Apartments and Penthouses) Linen and Towels. Rates quoted above are per room per night based on twin share, extra person rates apply and subject to availability. Blackout periods may apply over the Christmas holidays. Please be aware operators pass on credit card merchant fees so there is a non-refundable 2.5% surcharge for VISA and MASTERCARD card purchases. Please advise us before booking if any passengers are under 18 years old to ensure this is the appropriate accommodation. Rack rates are available year round for 1 and 2 night reservations. These rates are only available over the following dates which have a minimum 3 night stay due to peak season. Minimum 3 night stay over Christmas and New Year 22/12/18 â€“ 06/01/19 inclusive. Child aged 0 - 3 years free of charge. Amended or cancelled reservations within 48 hours of the arrival date incur a cancellation fee equivalent to 1 nights accommodation. All cancellations will forfeit the deposit paid at time of booking. Your credit card details will be passed on to the accommodation to secure your booking. Any cancellations within 14 days will forfeit full amount. We strongly recommend that you have travel insurance.